How to create value is the best way to start a business. The installation of solar power, together with the price of solar panels in the Philippines, has come down so low these days that any business or astute homeowner should start counting the wealth of energy that falls on their roof and use that to pay down the electric bill. Using solar energy to fuel your own personal power plant is is the ingenuity and adaptation that drives the Filipino Economy for self reliance and lower energy costs. It is in our nature to create value in everything we do. Installing solar and paying less than P2 pesos a kWh is just smart since there is no escaping an electric bill until now and burning more coal these days is just dumb. At Solaric, we are realists and renewable energy professionals. 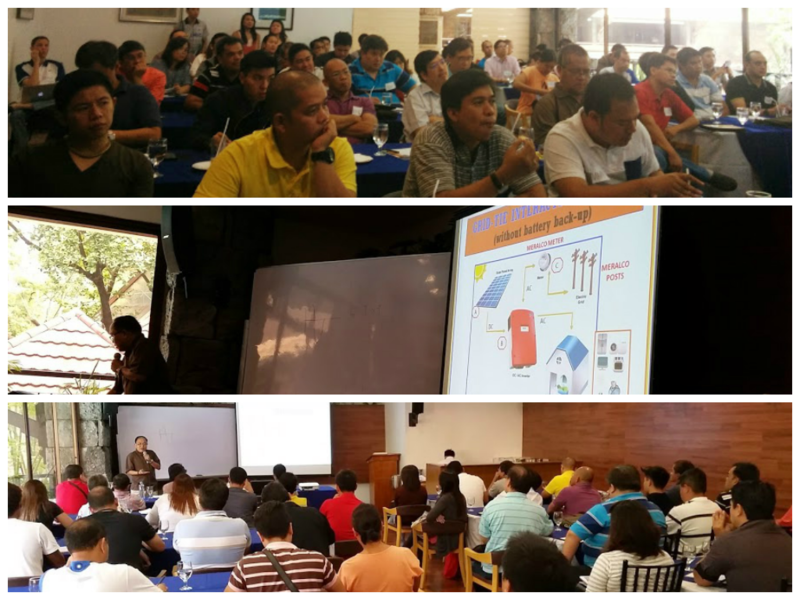 We have a different approach in bringing mass adaptation of Solar throughout the Philippines and that is through our Solar installer and pro user education programs called Solar 101 and Solar 202. Our graduates have powered entire factories and many homes with our Philippine solar power systems and designs from straight from class notes and our renowned engineering support to confidently energize your project. In the past three years we have condensed a weeklong US solar installer training program and experience of doing hundreds of installations into a weekend seminar covering theory, practical design, system sizing, safety and live installation of real gear. Pertinent topics that cover the Philippines such as black out run capable systems, ROI calculations, and Net Metering so you don’t have to buy batteries are discussed in an open forum manner. These are topics that any serious businessman or astute housewife should know before spending thousands on a solar system that can power a refrigerator to an escalator. Our Solar 101 and 202 seminars is a semi technical course that allows any college level person or engineer to understand the practical aspects of Philippine solar systems and how it can economically bring down electricity bills, replace diesel generation and most importantly teach the average consumer or policy maker on what type of solar system to install in a no nonsense non biased manner. Grid tie, off grid and the latest Lithium Hybrid systems are discussed at length and a graduate of this course can figure out what solar solution would best fit their needs and how not to waste money on common mistakes. Our solar 202 graduates start businesses with our preferential industry pricing which is too low to print to purchase solar panels and other gear without the burden of stocking inventory. Thousands of people from all walks of life- Housewives, business owners, Energy managers, and even other solar companies have made this a popular course over the past 3 years. Every chapter and page of content of this class is based on practical or actual experiences in solar projects in the Philippines. Yes, it is uncommon for a company to divulge trade secrets in its operations but we are a rather unconventional and our energy source is truly universal. Our view is that quality fundamentals and techniques are needed to make renewable energy grow in sunny Philippines and that is how we put a little Solaric install in every island. 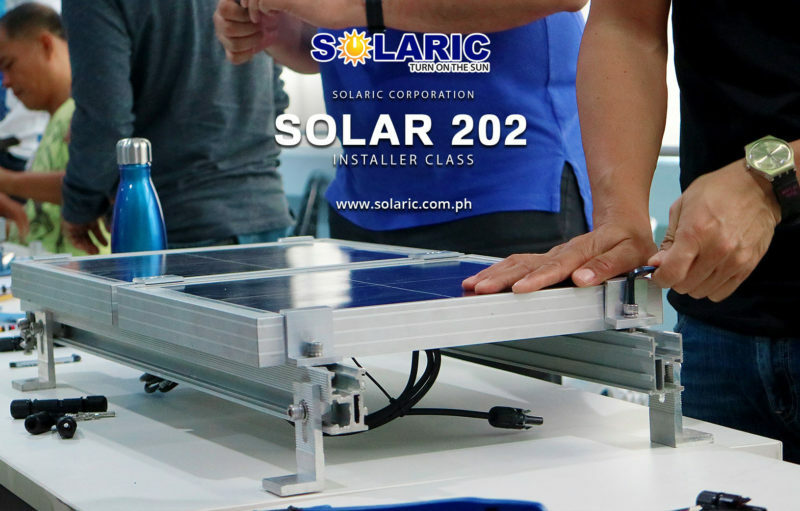 solar 101 by SolaricNext class is August 12 and 13 at Mess Hall Karravin Plaza Pasong Tamo Ext Makati, with hands on conducted in our newly built solaric training showroom with millions of pesos worth of teaching aids and setups of every deployable solar technology. Class sizes are limited and pre registration and payment is strongly recommended as we had to turn down walk ins in the past.